Easy-Haul Inc. - Easy Haul, Inc. 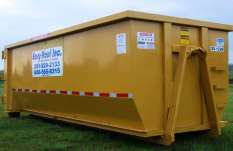 Waste Containers / Dumpsters – We offer fast roll-off dumpster rental service to Mobile, AL and Baldwin County, Alabama. Professional drivers carefully place your waste waste dumpster; respecting your property, lawn or job site. Our selection of roll off dumpster sizes means we have the right dumpster for your dumpster rental needs. Our roll-off container prices are very competitive with no hidden fees. A clean job site is a safe job site saving you money and time. 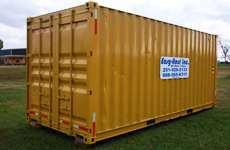 Job Site Storage Containers – Need portable job site storage containers? We offer 20′ heavy steel job site storage containers / ground level storage. If you need a storage container for a few days or for several months, we have the solution. Our job-site storage containers are rugged, secure and offer plenty of room to store tools, materials, furniture, etc. 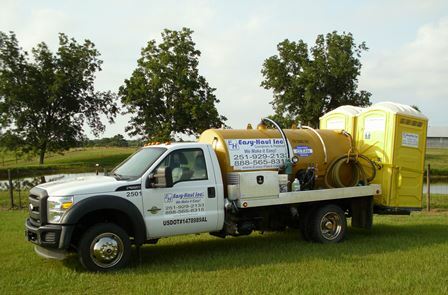 Portable Restrooms / Porta Johns – Our portable restrooms are the cleanest in the business. We take great pride in maintaining quality portable toilets. Each unit includes a hand sanitizer, mirror and is fully stocked. We also have handicap units, high rise lift-able units, hand-washing stations and holding tanks available. Our pricing is very competitive and our service is outstanding.